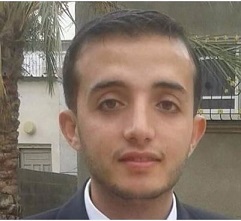 The Al-Qassam Brigades, the military wing of the Islamic Resistance Movement (Hamas) has reported that one of its fighters was killed, Saturday, in a tunnel accident, in Khan Younis, in the southern part of the Gaza Strip.On its webpage, the al-Qassam said Anwar Faraj Abu al-Ghalban, 23 years of age, died while working in a tunnel, and that the slain fighter is from Khan Younis city. 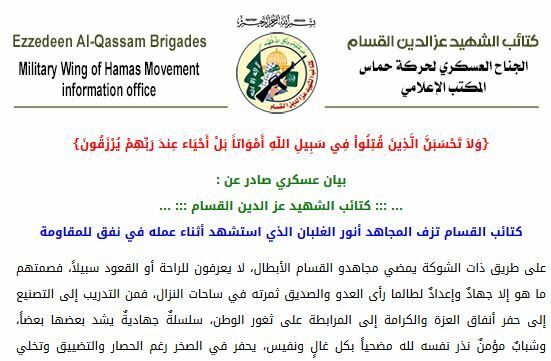 The Brigades said it will continue its operations and activities, including digging siege-busting tunnels, and military training, until ending the Israeli occupation, and the liberation of Palestine. Dozens of fighters, and tunnel workers, have been killed in similar accidents, while many were killed after the Israeli army bombarded tunnel areas as they were working in them. Many Palestinians in Gaza, not affiliated with the armed resistance, work in tunnels to provide food to their families due to the deadly Israeli siege on the coastal region.